Air Moldova and LOT Polish Airlines signed the Special Prorate Agreement which entered in force on December 1st, 2015. 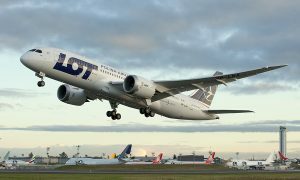 The main goal of this agreement is to offer passengers new routings for flights from Moldova to LOT Polish Airlines route network with convenient connections in Warsaw Chopin airport situated in the capital of Poland. Air Moldova’s passengers can take advantage of the flight routes to New-York, Chicago, Toronto and all European including all Polish destinations which are operated by LOT from Warsaw. – on Tuesdays and Saturdays: (flight 9U 9516: departure from Chisinau at 17:55, arrival to Warsaw at 18:45), (flight 9U 9515: departure from Warsaw at 14:30, arrival to Chisinau at 17:20).